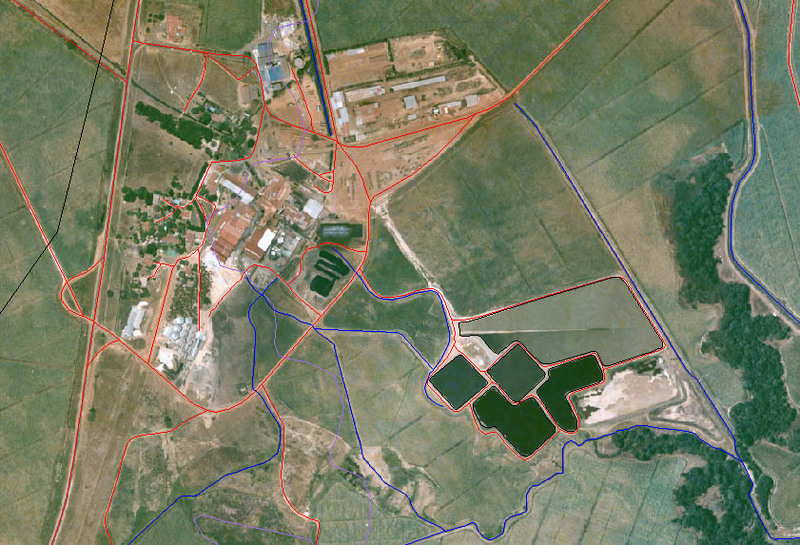 Does your organization need a spatial data solution? 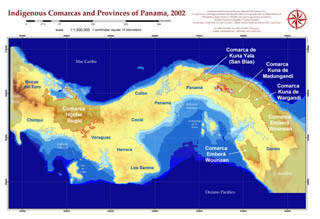 SIG Republic 250k - digital geographic database of the Republic of Panama derived from a variety of sources, of which the primary source is the 2001-2002 Instituto Geográfico Nacional "Tommy Guardia" 1:250,000 scale 12 sheet map set. SIG Panama 2,500 - all roads, streets, exact buildings footprints at 1,2,500 scale, rivers, streams, coast, bridges, air fields, 100 meter grid, boundaries of Corregimientos, buildings classed by type or function, with beginning and ending addresses of blocks and names of major buildings for the entire Republic of Panama includes all metropolitan and rural areas All the street are digitized as centerlines with the street name attributes and the actual extent of the pavement as well. Includes as an option the year 2000 census data. 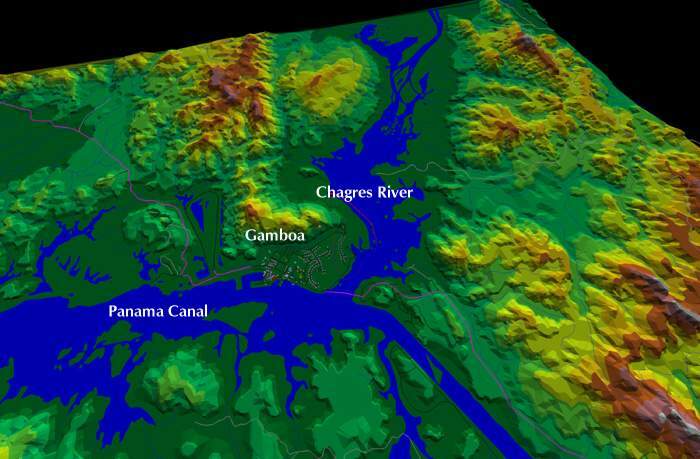 SIG City DEM - 5m contours and hill-top spot elevations from 1:5,000 scale maps of Panama Metropolitan area and DEM created from the 5m contours. Purchase orders for SIG City DEM will receive a 10% discount and if they have previously purchased SIG City and they will receive the building heights of all major buildings in the Panama Metropolitan area free. With the DEM and building heights clients will be able to prepare a very precise three-dimensional model of the metro area. GIS Capabilities - GIS Hardware, software, training, GPS technology, data conversion, data capture, large format printing and scanning, raster-vector conversion, database integration with digital maps, aerial photography with airborne GPS, ortho photographs, high-precision GPS surveying, thematic mapping, complex engineering applications, DEMs, three dimensional modeling and satellite imagery. 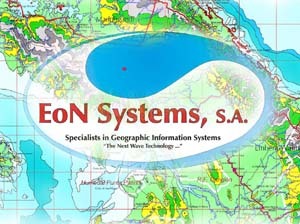 GIS Application areas - telecommunications, electric and water utilities, transportation, marketing analysis, government applications, eco-tourism, scientific projects, land surveying, feasibility studies, site location, natural resources management, presentation graphics, commercial applications, distribution systems, engineering, mining, agriculture, health, and emergency response systems. License - We provide pricing for a departmental license for use in a single division or department. The license permits up to three installation on separate computers or installation on a network for up to three simultaneous users. We also provide an enterprise wide unlimited license or we can create a custom corporate license that meets you specific needs. Update - We provide updates to our GIS database from time to time free of charge or at reduced pricing. If we fix geographic features that have defects, we generally offer the update free to existing clients. If we add major features we charge a significantly reduced fee. Distribution and Formats - All the above coverages are distributed on CD ROM in ArcView shape files or ARC/INFO coverages. Other formats are available by special request. 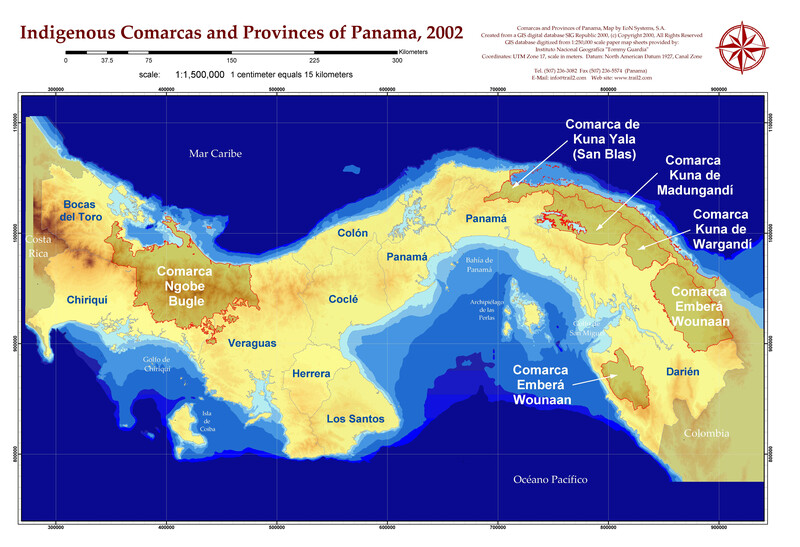 Coverages are in UTM coordinate system and referenced to the datum NAD 27 Canal Zone. Training - We also have a sophisticated training facility and provide training in all areas of advanced computing including GIS. We would be pleased to provide a proposal for any scope of training that you may require in either English or Spanish. Guarantee - If you need to review our products again or have any questions we would be pleased to answer them. All of our products represent the highest quality in workmanship and are backed by a 100% satisfaction guarantee. You have 14 days to review our products after purchase and may return them within this time period for a complete refund. SIG Republic 250k is a digital geographic database of the Republic of Panama derived from a variety of sources, of which the primary source is the Instituto Geográfico Nacional "Tommy Guardia" 1:250,000 scale 12 sheet map set. 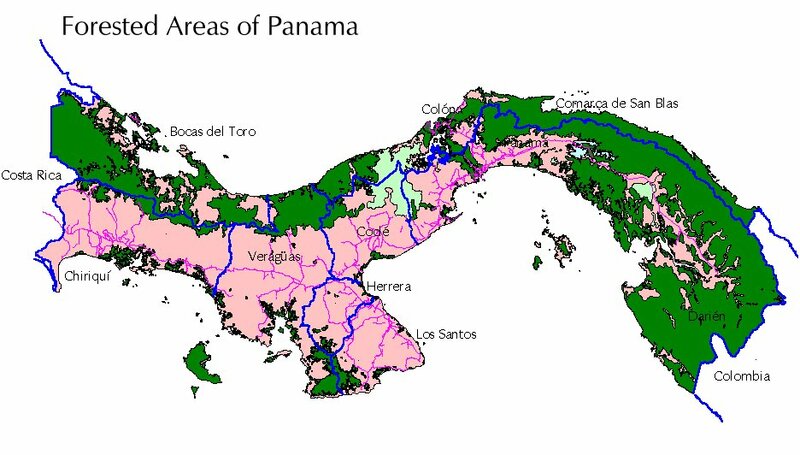 These map sheets are based upon photo-planimetric data from 1982 and represents the most comprehensive available source of spatial data at this scale for the Republic of Panama. 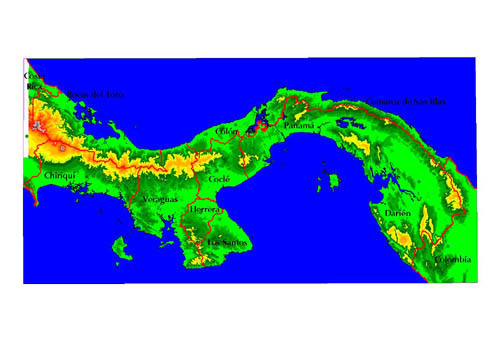 From this primary source, we have created a comprehensive national digital spatial data base in ArcView shape file format. The coverages are referenced in UTM coordinate system. Hydrology: ocean, rivers, streams and lakes, each feature assigned an attribute containing the features name. Contour intervals at 200 meter with some supplementary contour intervals at 100 meters High elevation points from most hills and peak to complement the contour intervals Transportation network with primary, secondary and tertiary highways and roads, each . Political divisions including national, provincial, district and corrigimientos boundaries. 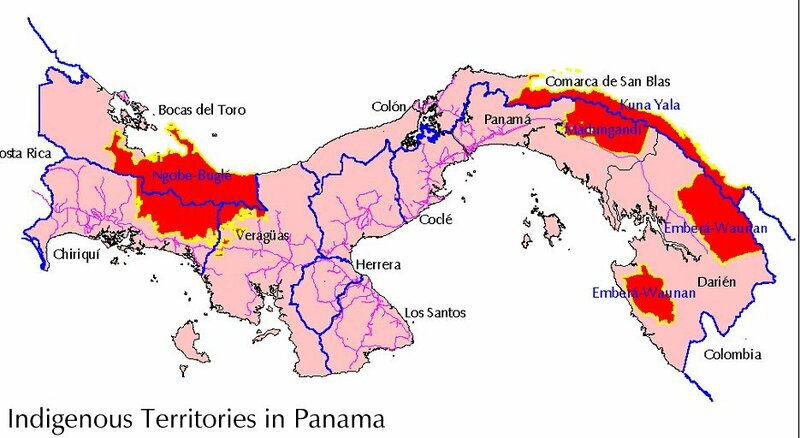 As the district and corrigimientos boundaries on the 1:250,000 scale Tommy Guardia map sheets are inaccurate; we digitized the boundaries from the Controloria (Comptroller) maps of the official political boundaries. Over 6,000 points representing cities, towns and villages with over 100 individuals in population. Many of the town locations were digitized from 1:50,000 scale maps for more precise locations. Some towns were digitized from the 1:250,000 scale maps where 1:50,000 scale maps were not available. Most of the towns are integrated with a sophisticated database of the census population and socio-economic data from the 1990 census. This census data includes: number of men, women, children, age ranges, education backgrounds, median income, number of households, house construction, access to services, percentage households with radio, television, telephone, etc. This census data provide a complete demographic and socio-economic profile of each town. 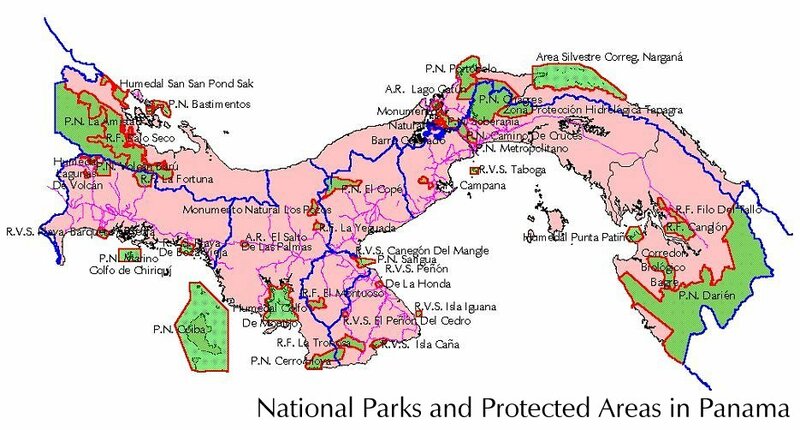 Protected areas, forest reserves, national parks, biosphere reserves and national monuments (123kb) each area has several attributes. Area name, law that established the protected area, date of establishment, agency and administrator of the park. 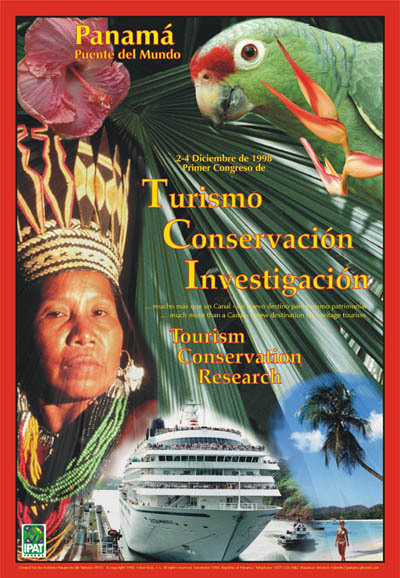 Indigenous Comarcas (98 kb) includes precise boundaries for all indigenous area including Comarca de San Blas, Ngobe-Buglé, Madungandí and Sambú and Cemaco Emberá and Waunaun Indignous territories Forested areas (115 kb) of Panama derived from 1992 satellite images includes three primary categories – old growth forest, high disturbed forest and no forest. Index of poverty at the District level, derived from 1990 Census data Geographic locations – the database includes a coverage of the names and location of geographic features as a gazetteer coverage. This coverage includes the location of areas that are not water features or towns. 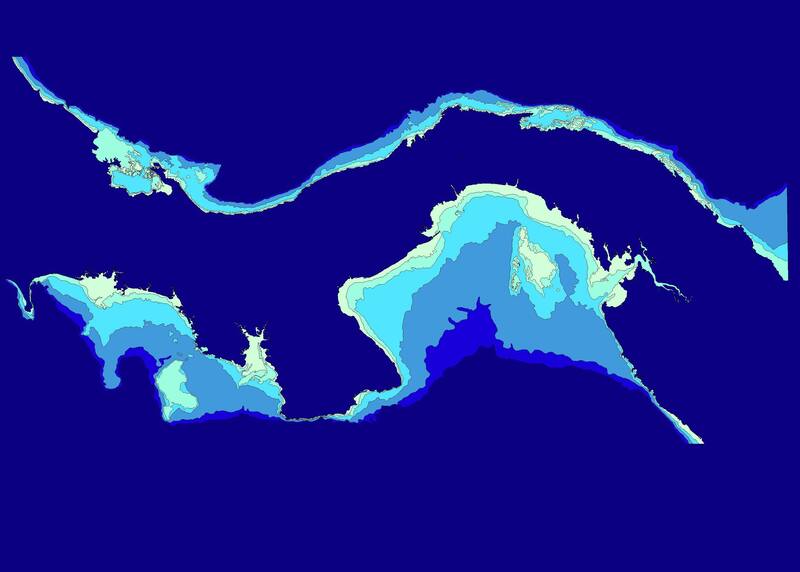 For example, names of islands, capes and peninsulas. 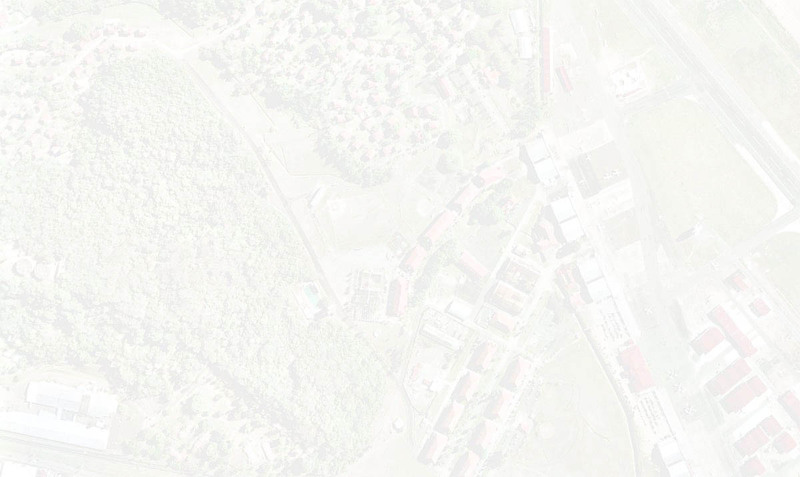 UTM grid at 10 kilometers for ease of use in map publications. Three-dimensional model of the Republic of Panama derived from the 200-meter contour intervals and high elevation points. 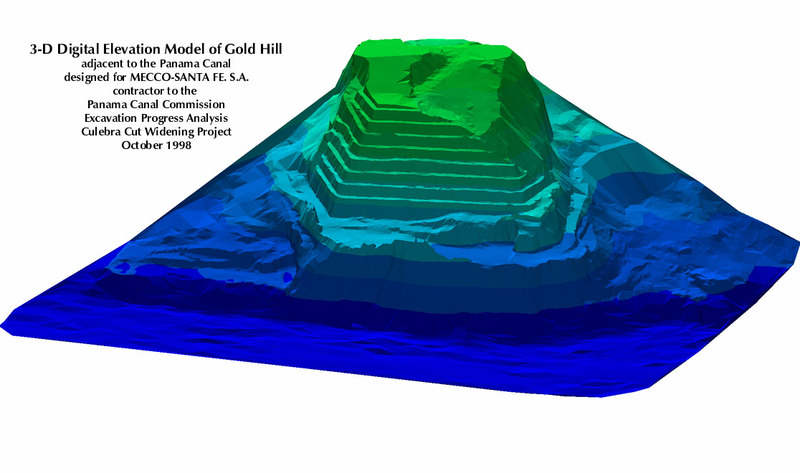 The model is stored as a geo-referenced raster image. A pre-designed ArcView project with map views, thematic maps and map layouts for ease of use in creating high-quality map publications. SIG Republic is provided with ArcExplorer from (Environmental Studies Research Institute -ESRI), an easy to use GIS visualization program that permits user to view, pan, zoom, identify, query and print GIS databases. In all case, SIG Republic makes extensive use of attribute tables to ensure that all significant features have names and appropriate attributes assigned to them. 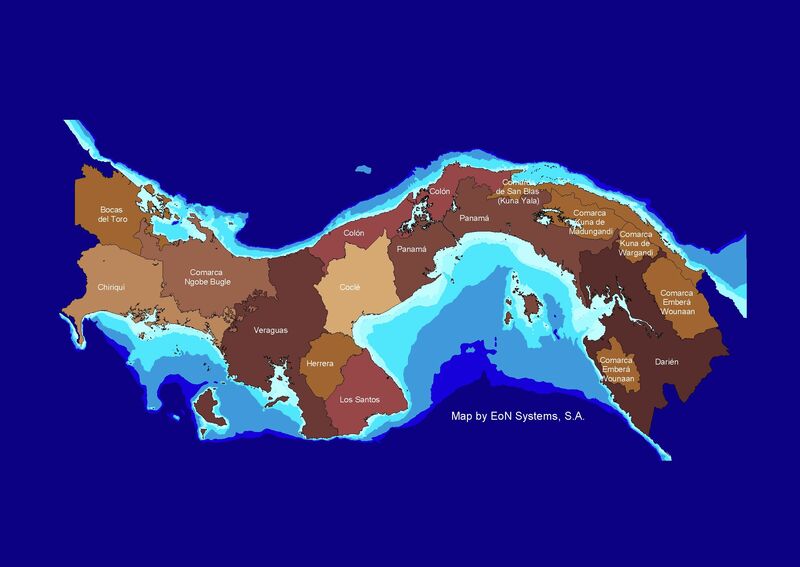 As the maps contains all internal political boundaries provinces, districts and Corrigimientos SIG Republic users can assigned any custom attributes to these political features that they wish and create thematic maps and perform spatial analysis on the attributes that they assign. For example, an agriculture analyst may wish to assign rice crop production figures for each corregimiento and then create a thematic map where color represents a particular range of rice production. 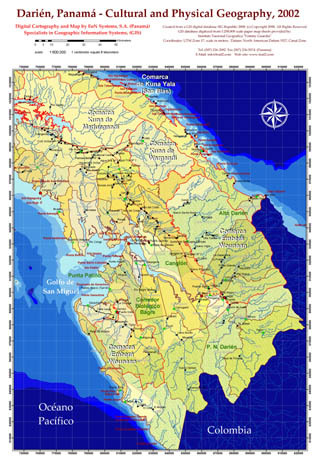 SIG Republic, suitable for national and regional analysis, can serve as a GIS database for inserting local data as well. For example, each town is represented by single point however, a user could substitute a complete municipal GIS with streets and buildings within the SIG Republic database. 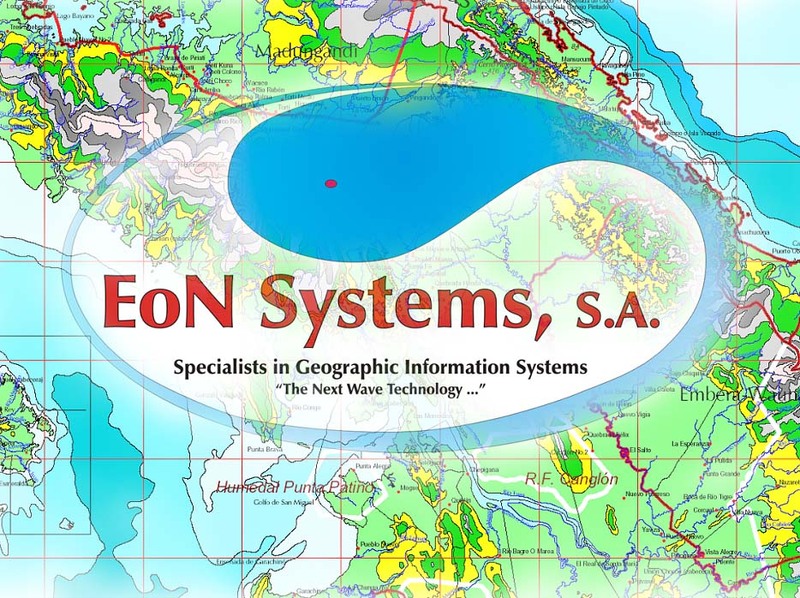 The Digital GIS databases are delivered on CD-ROM in ArcView shape file format for use with products compatible with GIS data from Environmental Studies Research Institute (ESRI). The databases are available in a variety of other formats including AutoCAD .dxf or .dwg, ARC/INFO coverage format or most other vectors formats by special order. All user of SIG Republic will sign a license that delineates their use rights and obligations. The client may install as many copies of SIG Republic within their specific department or organization as indicated by their license agreement. They may make any modifications they wish and to derive maps, products and publications from the digital database. The client, however, is prohibited from transferring the vector digital database to others outside their specific organization or department and from commercializing the data without a specific agreement to do so. In general, the license agreement provides the user of the product with a wide variety of abilities but prohibits the transfer of the digital database to third parties outside their specific organization named in the license agreement. We would be pleased to negotiate any requirements that you may have if it is not covered by the existing standard license agreement. Copies of the license agreement are available on request; anyone interested in purchasing SIG Republic should carefully read the license agreement. SIG Republic 250k with the above coverages is priced for a single license for a single specific individual, division or department which includes installation on up to 3 multiple machines or on a departmental network server with up to 3 simultaneous users. SIG Republic 250k Enterprise is priced for an agency or institutional-wide license which includes installation on unlimited number of machines or on a network server with unlimited simultaneous users within the institution. Multiple agency pricing is available upon request. Although SIG Republic represents some of our highest quality GIS workmanship, Cyber-Tech does not make any specific claims to accuracy, precision or suitability and the product is sold "as is". The potential client should examine the database personally to make their own assessment of the precision and suitability for a specific application. The media and file structures are guaranteed to be free of technical defects and functional; it will be replaced free of charge if defective. In addition, if the client should damage the original media, we will charge a small fee for a replacement. From time to time updates may be offered to the client free or at a significant discount. For more information or a demonstration of GIS technology, SIG Republic and our other GIS products, please contact us at the info@trail2.com.